Lexmark T630, T632 and T634 supplies are designed for the highest quality output, page after page, thanks to our technical experience, high production standards and rigorous product testing. The supplies are designed for easy customer installation and quality performance, from the first page to the last. The 21,000-page High Yield Print Cartridge improves productivity and reduces hidden operating costs by reducing scheduled interventions and ordering. It?s also friendlier for the environment, requiring fewer cartridges and less packaging. To take advantage of the Prebate program, you simply agree to use each cartridge one time and, when it's empty, return it only to Lexmark or your participating dealer. So why the special deal? It's just one more way we help you cut printing costs. By the way, if for any reason you prefer not to take advantage of Prebate, you can buy regular cartridges at regular prices without these terms. 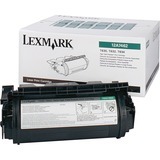 Features Lexmark T630, T632 and T634 supplies are designed for the highest quality output and are designed for easy customer installation and quality performance, from the first page to the last.